In order for your Data Activity Auditing Report to produce results, an Audit Policy must first be put in place. Select Tools > System Utilities > Admin Utilities > Audit Utilities > Auditing Policy Maintenance. The Working Database is the database that you are currently working in. You should leave this setting as the default. A series of buttons in the center of the screen perform standard add, Save, Cancel, Delete, Copy and Reset functions. They highlight/darken when that particular option is available. While on the Policy tab, click File > Add Record. Enter the Audit Policy name and description. Select File > Save Record to save the policy. 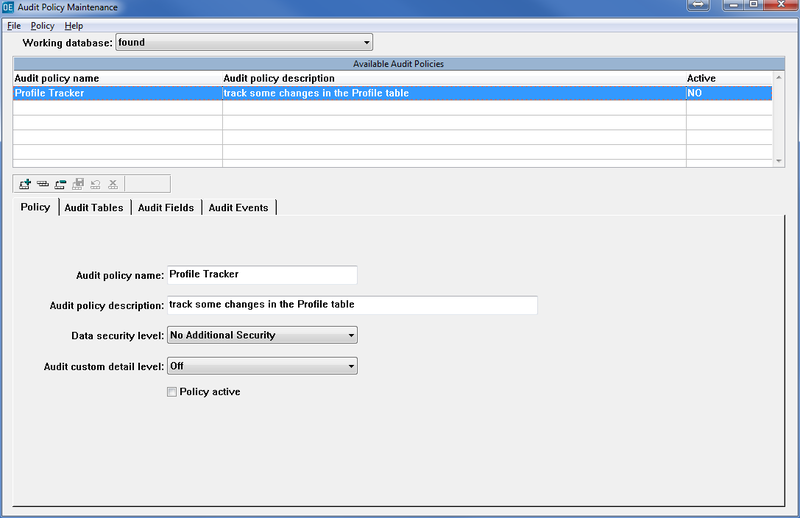 Once saved, one or more tables must be added to the policy via the Audit Tables Tab. To track field level changes, fields must also be added to the audit policy. In order for this policy to record and track changes, Audit Events must also be added to the Audit Policy.